Richard (Rick) H. Profit, Jr. has been the Director, President and a board member of PAACT for over fourteen years. Rick is the stepson of Lloyd Ney, PAACT’s founder and the son of Janet Ney, Lloyd’s widow and PAACT Board Member. 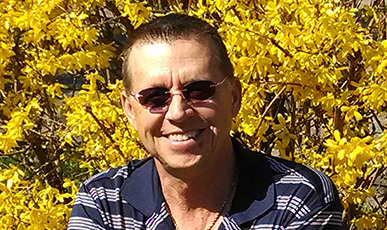 Rick is 57 years of age, married 37 years, has two children and 4 grandchildren. His daughter Nichole is 35 years old, married and has 2 children, both boys ages 6 years and 2 years old. She has a Bachelors of Science in Business Administration (BSBA) from Grand Valley State University and a Masters of Science in Business Administration (MSBA) from Cornerstone University. Nichole works for Spectrum Health Hospitals in Grand Rapids, Michigan. His son, Dustin is 32 years old, married and has 2 children, both boys ages 5 and 1 1/2 years old. He works in Construction throughout Michigan. Rick is a graduate of Aquinas College and has a BSBA. Most of Rick’s working life was spent in the food service industry where he was employed in business and management. He was also self-employed for over 16 years. Rick had a close relationship with Lloyd for over 25 years. Some of his compassion for Prostate Cancer patients derives from that relationship and from his own experience with a life threatening illness. At the age of 22, during a routine physical, it was discovered that his liver enzymes were elevated well above normal. In August of 1995 Rick was admitted to the hospital for emergency gall bladder surgery. At that time it was discovered he had cirrhosis of the liver and that the condition was far worse than the blood tests had indicated. He was diagnosed as having a rare liver disease known as primary sclerosing cholangitis. His condition eventually became life threatening and a liver transplant was necessary for survival. After an 18 month wait, that included hospitalization on 7 different occasions, a liver finally became available for him on May 1, 1997. The surgery was successful and recovery complete. The above quote is one that stays near and dear to my heart. Thanks to another individual who took this quote as truth, my family has been given the gift of an additional 17 1/2 years with my father (and hopefully many more). At the age of 22, my father was diagnosed with primary sclerosing cholangitis, a liver disease. At the time dad went about living life as he always had, but eighteen years later, at the age of 40, that all changed. An emergency gall bladder surgery led physicians to discover that my dad’s liver disease had significantly progressed. My dad was told to go to the University of Michigan Hospital to discuss a liver transplant. Without a transplant his life expectancy was very low. After 18 months on the transplant list, battling many infections, enduring multiple hospital stays and other side effects of his disease, we were notified that a liver was available. After 21 hours and tying off over 2000 capillaries the surgery was a success. That was 17 1/2 years ago, May 1, 1997. Rick is now going on his 17 1/2 year post transplant. It is with this unique personal history and business background that gives Rick the compassion and understanding needed to relate and communicate with Prostate Cancer patients as a member of the PAACT team.